Over the years we've developed commercial and lavish residence buildings in the lap of nature for people believe in creating a better tomorrow. Sitting on an idea of design from scratch to planning to its execution on a large scale is itself a challenge, but the most important part is to build something that people want to own and live in and that's what we love to take up. We are leading the housing construction to a new level. We are one of the first in the country using state of the art technology in the process, which we call the 3S system of construction, derived as speed, strength, and safety. Our buildings are constructed with 100% RCC, a brick-less structure designed with more seismic consideration, smooth finishing by aluminum formwork technology. It also includes the features of self-compacting concrete, monolithic casting, the joint-less floor for durability and uniform strength and required no plaster. We are developing a place beyond imagination in the most peaceful sites which are also well connected to the fast lanes of modern lifestyle. “A vision without a strategy remains illusion” and we take it very seriously. With our excellent team of engineers, the idea moves on to develop into a design as the desired structure. Considering determination, innovation and originality our main approach, we plan our goals, set for any project. Following the RERA Act, we make sure everything that goes under construction should be within the law. We pre-visualize every step of the process that will be executed floor by floor. We use the best inline raw material in line for construction but to double check everything that goes into the building, our engineers put them under stringent lab testing and pass it on after complete satisfaction. We use unique components in the building, be it floors, columns, staircase, walls.  Our buildings are constructed with 100% RCC, a brick-less structure designed with more seismic consideration, smooth finishing by aluminum formwork technology which are leakage, seepage and crack free. We are one of the first in the country matching the international standards by using state of the art technology in the process, which we call the 3S system of construction, derived as speed, strength, and safety. It also includes the features of self-compacting concrete, monolithic casting, the joint-less floors for durability and uniform strength and required no plaster. We are developing a place beyond imagination in the most peaceful sites which are also well connected to the fast lanes of modern lifestyle.